The world is made up matter. Plasma is among the four fundamental elements of matter. The other three states of matter are solid, liquid and gas, with Plasma being the fourth. Unlike the other three states, plasma has very different properties. Due to its unique properties, it is used for many things including cutting through materials that can conduct electricity. This is where the plasma cutter comes in. A plasma cutter is an equipment normally used for the cutting of electrically conducive objects like aluminum, copper, brass or steel. There are various industries that use a plasma cutter for their activities. Examples of places that use plasma cutters are: welding shops, industries, automotive industries, and even in metal scrapping and salvaging industries. In the market, there are a number of plasma cutters and a buyer needs to beware of what they are buying. 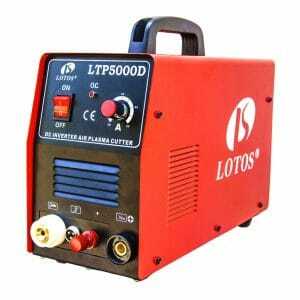 The Lotos LTP5000D plasma cutter model is the latest Lotos technology for plasma cutters. It is a 50Amp Non-touch Pilot Arc Plasma cutter with dual voltage of 110V and 220V. Its manufacturer describes it as a 1/2 inch clean cutter. According to customer reviews, the Lotos technology cutter works best on the latter voltage 220V, but also works quite effectively at 110V. For this product to be used well, a person will need two items: an air hose which has a female connector. With a female connector, one can easily connect and disconnect the air inlet. The other important item is the air compressor. The Lotos technology is one of the best, but it definitely has its pros and cons. It is a dual voltage cutter with a choice between the 110V and the 220V. Compared to the other cutters, it has a neater cut. 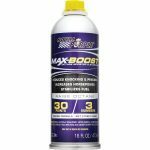 The Powermax30 XP has a casing and is an American edition with a two in one edition. It has a capability of cutting thick metallic surfaces as well as delicate metals which need fine precision. It is well packaged and easily portable. 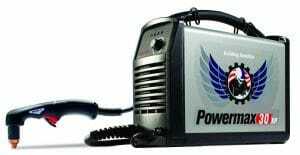 The powermax30comes with consumables such as plugs for both the 120V and the 240V circuits, shaded glass, a carrier case, and a shield mask and even cutting gloves. Has the ability to cut metals with precise accuracy. Does not require any explosive gases or extra expensive gas. On the most part, this is a great cutter, but it can be really fast. Because of this, a person has to be really steady to achieve a clean cut with this cutter. 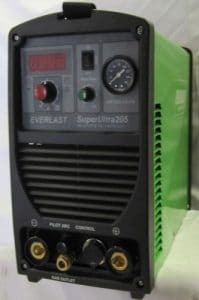 This is a SuperUltra 205 200a Tig stick plasma cutter. 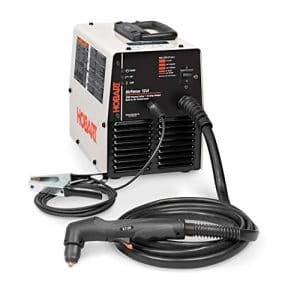 It is a multipurpose Welder with dual voltage, i.e. 110V and 220V. It is a great tool for portable duties since it is a compact tool. It is also great at repairs. Clean and smooth cut on any metal that comes its way. It has a low electric consumption due to its great inverter design. The Versa cut60 plasma is a strong cutter. It has the ability of easily slicing materials that are 7 or even 8 inches thick. Not only does it cut through the thick heavy metals, it also cuts through thin metals and has a neat cut to it. Its built-in pilot arc allows a user to have stability and precision when cutting. It happens to have an in-built moisture separator which allow only clean air to pass through the torch. 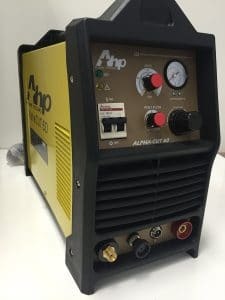 The AHP plasma cutter has a recent 2016 model called AlphaCut 60 60Amp Plasma cutter. This cutter has a dual voltage of 11oV and 220V. It has a good pilot arc which enables a user to cut through objects like rusted metals, painted metals and even expanded metals precisely. Has a dual voltage with a plug that has the ability to quickly switch from the 220V to the 110V and vice versa. 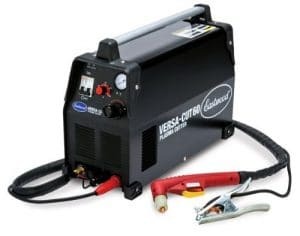 The 500564 Airforce 12i Plasma cutter is the way to go if one needs a cutter that works perfectly at home or in small welding environments. It works perfectly in harsh environments, but is really comfortable to use. Does not have a CNC torch, and is generally not CNC compatible. Plasma Cutters have revolutionized how metal and electrically compatible objects are cut. Anyone who has not yet embraced this technology is missing out on a great opportunity to save costs, time and energy.